(1998) 128pp., 4 maps, 28 b/w illus., 25 x 17 cm, paperback. ISBN 0 9518382 1 0. In 1650 the first ship loaded with Cheshire cheese sailed from Chester to London. So popular did it become that within a few years several pubs in London were called The Cheshire Cheese. This trade led to important changes in the shape of rural life in the North-West. 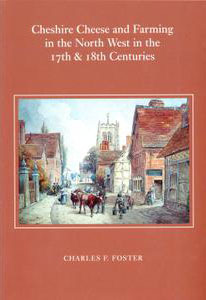 In the course of charting these developments Charles Foster provides fascinating details about daily life on the farms, the people who worked the land and the men who sailed the ships between London and north-western ports. The Warburton family of Arley Hall, near Northwich in Cheshire, created and preserved a set of early modern estate archives that seem clearly to be an historian&apos;s dream. This is the second book to be based on them and, though short, it achieves a level of precision in understanding the operations of both the estate and its tenantry which is rare indeed. Some fascinating incidents emerge which have a significance far beyond their immediate importance. Thus, a cattle plague left some grazing surplus to requirements in 1750 and experiements in arable cultivation were tried, confirming, amongst other things, that turnips were emphatically not a panacea.Overall, the previous, apparently lackadaisical, renting of the grass to local cottagers for a set charge per animal per season, was clearly shown to give returns higher than any alternative, whilst it also underpinned the area&apos;s very efficient small farming system. North-Western farming is now emerging from the period when its deviation from accepted norms was simply seen as bad husbandry and this book will help confirm that small farms, pastoralism and an organic response to market opportunities could actually be a winning combination. Steve Caunce, University of Central Lancashire. The first essay on the cheese trade is, and I have not changed my mind on this one, one of the most important pieces of writing on agriculture in northern England of recent years. It is also a very valuable addition to a sparse literature on the domestic trade of a staple commodity. I think the essay contains some fine deductive logic. The demonstration of links between the changing technology of cheese making, the demands of the London market for cheeses of a certain weight ( and hence consistency), the need to have herds of a certain size to make the cheeses, and the engrossment of farms to make larger units to support larger herds, is masterly. On a second and more detailed reading, I find there is still much to praise but rather more to quibble over than I remembered. But this is a very valuable book for which Mr Foster is to be congratulated. The companion book is eagerly awaited.